I booked this hotel last minute, as there was a death in the family and I had to attend the wake and funeral as well as certain family time my family usually has at such occasions. I got a great price, the staff were great and they weren’t overly pushy (I’ve heard some horror stories of other hotels’ staff!). This was my first time driving across the island all by myself, and with the stress and grief of the situation I was hoping all those horror stories wouldn’t happen and at least the hotel would be fine. I was warmly welcomed, room was clean when I arrived, and staff had it cleaned conveniently while I wasn’t in my room. The room itself was perfect for just me—cozy (and big!) bed, little couch to sit, and a desk where I managed to get some work done during some downtime. If I am ever headed that way, and need to book a hotel, I will definitely be booking here again! Staff was less than friendly at check-in. Felt like we were inconveniencing her. In room air conditioner was old and controls were missing. Room was clean and comfortable. Parking is limited, as the lot is shared with the hotel next door. Overall, hotel is a bit long in the tooth, but the room is clean and comfortable. Where to find Stephenville hotels near an airport? Where can I find hotels in Stephenville that are near tourist attractions? Planning to visit Newfoundland? Looking to book a hotel conveniently located near the center of Stephenville? The center of Stephenville offers 2 accommodation options within easy driving distance. There are only a handful of hotels to choose from within an easy walk from the center of Stephenville. The Days Inn Stephenville is a good option as it is only 3 kilometres (2 miles) away. The Days Inn Stephenville is 2 kilometres (1 mile) away from the heart of Stephenville. 3 kilometres (2 miles) away is the Dreamcatcher Lodge which is an alternative. 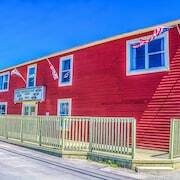 After you've enjoyed Stephenville, you should make time to explore the many other delights of the Newfoundland area. Investigate Newfoundland's old towns, cathedrals and art museums and also photograph the area's rivers and streams. Travelers in this part of Canada often enjoy snowboarding. The closest accommodations in Newfoundland are Steady Brook and Corner Brook. Steady Brook is 70 kilometres (44 miles) to the northeast of Stephenville, while Corner Brook is 65 kilometres (39 miles) to the northeast. Steady Brook hotels and apartments are the Marble Villa at Marble Mountain Resort and Marble Inn Resort. 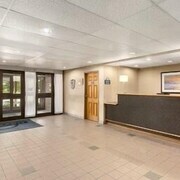 While Corner Brook accommodation options are the Glynmill Inn and Comfort Inn. Just because you're traveling in Newfoundland, doesn't mean you can't enjoy your passion for sport. You'll find My Newfoundland Adventures 65 kilometres (39 miles) to the northeast of Stephenville. For tourists who are keen on booking a bed nearby, make a reservation in the Grenfell Campus Summer Accommodations or Greenwood Inn & Suites. Deer Lake Regional Airport is a logical airport for flying into and leaving Stephenville. It is 110 kilometres (70 miles) drive away. If you would like to stay nearby, try the Holiday Inn Express Deer Lake or Deer Lake Motel. Are there hotels in other cities near Stephenville? Explore Stephenville with Expedia.ca’s Travel Guides to find the best flights, cars, holiday packages and more!